URBANA, Ill. – In the past several years, oak trees in Illinois have continued to develop disease and pest problems. Each year, the University of Illinois Plant Clinic diagnoses hundreds of oak samples with multiple pest, disease, and cultural issues, said Stephanie Porter, a plant diagnostician and outreach specialist with the Plant Clinic. There are 21 different oak species native to Illinois, and oaks can be long-lived trees. 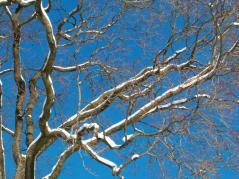 For example, specimens of white oak, the state tree of Illinois, have been known to live for more than 200 years. Many oak species that are used within the landscape are native; however, native does not translate to problem-free, Porter said. Problems can arise when trees are planted in locations where the species is not well adapted. Oaks require full sun and grow poorly when planted in shade. Soil preferences vary widely depending upon the oak species. Porter recommends researching the site conditions as well as the cultural requirements prior to purchasing and planting an oak species. “Time spent researching helps ensure the right tree is selected for the right place and avoids future problems,” she said. Porter, in collaboration with other U of I specialists, has recently released report titled Oak Problems. It includes pictures and brief descriptions of oak cultural issues as well as the most common disease and insect problems that affect oak each year in Illinois. This report can be downloaded from the U of I Plant Clinic website at: http://web.extension.illinois.edu/plantclinic/downloads/Plant%20Clinic%20Report%20Oak%20LO.pdf.